I love David's voice reading the bible and his English accent is such a pleasure to listen to. The only disappointment with this audio of the Bible is that it just says chapter and not which chapter of the bible so it is difficult to navigate. This is a very good recording/performance, but it needs a proper table of contents with the ability to navigate from the ToC. Many narrators seem to believe that much of the bible should be read in an angry tone (which never seemed right to me). David Suchet has a much gentler, more balanced tone (Chrislike I guess). I listen to audio versions of the Bible on almost a daily basis. Going forward this will be my 'go to' version. Driving home tonight listening to an older narration of the Bible (after years of listening to that version) I had a strong urge to find a better version. I find it very interesting that David Suchet's version was released just 7 days ago. I definitely consider that 'urge' to be the leading of God. God's living Word read well. Consistent delivery. Appropriate for all ages. This is worth every penny. Ok, What book in the New Testament is chapter 125? Best Audio Bible - good for anyone! What did you love best about Complete NIV Audio Bible (New Testament)? David Suchet knows what he is reading. He has wisely studied and used his wonderful voice and training to give us this. The Bible? It is living and true - applicable to all. I will say Luke and Acts. Pay attention to how the disciples figure out who Jesus really is and how they live after his death and resurrection. I have admired David Suchet ever since I was introduced to him as Hercule Poirot. To know that he is a born-again Christian who has no problem confessing it, makes this particular edition so extraordinary and special. Thank you, Mr. Suchet, for recording this work. First of all, I'm very glad to have the NIV version of the Bible without music or dramatic readings(though nothing wrong with them) But it seems the Bible doesn't need drama or music to highlight it(have same problem with red letter versions) But a good solid reading with perfect diction and at least some dramatic inflection seems the best reading for appreciation of the very words of the Bible. I thought Alexander Scourby's reading of the Bible would never be equalled because it never has, with many readings--until now. Suchet's reading has the right tone, perfect diction and inflection with just enough presentation to bring the words alive. At last, I think he's even better than Scourby, though similar. This is a reading to relish and hear again and again. A new summit reached! The Bible speaks for itself, though often underread,underappreciated, and misinterpreted. If read fresh and open it will open up broad horizens of spiritual understanding and appreciation. I liked his beautiful, well rounded, English voice and pronunciation. There are many moments but I leave it to a listener to find their own. Is there a navigable index? I had hoped to begin by listening to Paul's Epistle to the Galatians, which we are currently studying in small group, but I couldn't find an index. If there is a direct way to each book of the New Testament, I would love to revise my rating to 5 stars. The text and the narrator both deserve it! Just hard to follow from bible & at times made me feel like a third person reading style. David Suchet does a phenomenal job bringing these historical stories to life! The only issue is that the chapters aren't labeled. It's a big guessing game trying to skip around to find what you're looking for in 260 chapters. This product does not come with chapter indexing. There is over 19 hours of audio split into three parts. The quality of the recording by David Suchet is great but is let down by the poor technical side of the recording and the poor service from Audible. The chapter index pdf does exist, if you buy one of the other parts of David Suchet’s recording, but they have told me it is “impossible” for me to have it with this product. Great product let down by something as simple as a pdf file telling you where in the recording to go to listen to the book and chapter you want. Where does Complete NIV Audio Bible (New Testament) rank among all the audiobooks you’ve listened to so far? This is incredibly good and easy on the ear to listen to.I have never watched this man on the television or anything else he has been in although I am aware he is well known. But now I have listened to him read the bible I realise what an excellent orator he is! Well done David and thank you. I have been looking for a decent audio bible for so long. Now I have finally found it. I recommend this to all it's the best! Anyone familiar with the Bible would know that it is not a book but a collection of books. The Bible is a library. Sadly the Audible download come in three parts with no way of selecting the individual books and chapters. This is a real shame as David Suchet does a marvelous job. I will not be purchasing the Old Testament in the Audible form and it is disappointing that Audible did not make it clear that the download differed so greatly from the CD's. 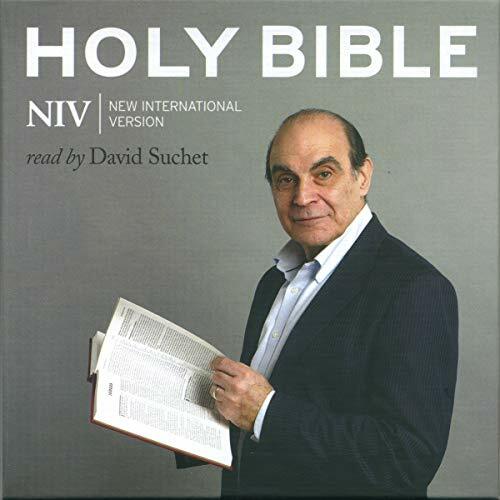 David Suchet brings the words of the Bible alive. His clear diction and sensitive rendering makes this the best Bible reading I've ever listened to. such a cool new way to read the bible and to understand it. I read and listen at the same time so it keeps me taking in every word instead of just skipping threw it.